Welcome to my collection of four beautiful beaded bracelets! 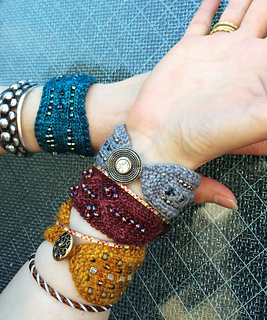 These little bracelets are a perfect opportunity to experiment with beads, and they make perfect gifts. 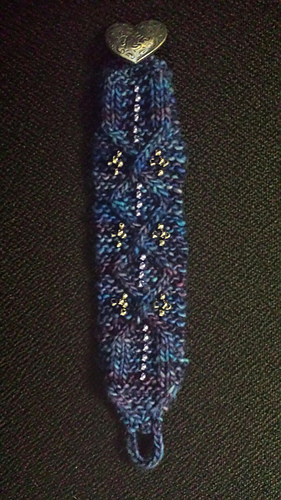 I have employed a variety of bead knitting techniques. I hope you enjoy the interaction of beads with the stitches and the ways they display their combined beauty, which I feel is greater than the sum of their parts. Buttons provide opportunities for more color and texture play. Bead requirements: Size 8/0, 6/0 or 5/0 seed beads, Japanese preferred for their larger inner hole. Amounts will vary per bracelet. 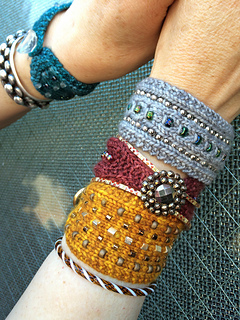 Pattern includes four bracelet designs. The bracelets are one size but most of the bracelets are easily modifiable for length.